Jeff Morris, an executive at Jewish agency who is also the author of Beachwood, The Book and the new website: The Haymarket to the Heights.. When I published our page on the Eagle Street Synagogue, the first synagogue in our city, built by what today is Anshe Chesed Fairmount Temple, I asked Nate and Jeff to review it. Nate, who on his tours of old Jewish Cleveland notes that the site of Eagle Street Synagogue was inside Progressive Field, made a comment in his reply: "I haven't seen it myself, but people have told me that there's a plaque at Progressive Field commemorating the synagogue." That's how last week I told Nate and Jeff that I would find that plaque, take pictures of it, and share them on these pages. Now, In Pursuit of the Plaque. On Friday May 1 I called the Cleveland Indians. After working through the call handling menu I reached an operator. I asked to speak to their Executive Vice President, Business, Dennis Lehman and I left a long message in his secretary's voicemail box. Dennis Lehman returned my call on Monday morning. 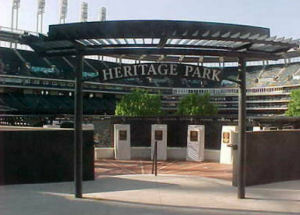 There may be a picture on the benches in Gateway Plaza, he said, but he know nothing about any commemoration of the location of the Eagle Street Synagogue within Progressive Field. Perhaps Bob DiBiasio, the Indians VP for Public Relations, might know. Then I spoke with Bob DiBiasio. 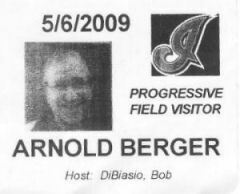 He, too, knew of no plaque within Progressive Field, but he invited me to come down and look for myself. It was best to visit while the team was out of town, so we set up a time on Wednesday morning May 6. Whenever I visit Progressive Field I wear my Indians baseball cap. With my new cap comes a story. My old cap, circa 1996, was adorned with a Chief Wahoo emblem. My three daughters all asked "Dad, how can you wear that cap?" In response, I bought a new baseball cap last year. Annoyed that my old cap, a symbol of America's great game, had not been made here, I remember telling the man behind the counter "I don't want another cap made in Bangladesh!" "No problem." he replied. "They are all from China." < My new cap has an inoffensive letter "I". I drove downtown from Shaker Square, parked on Ontario, and entered the lobby of the Executive Offices. The security was impressive. The attendant scanned my driver's license and gave me a photo-ID visitors badge. I was glad to see that the logo on my badge was an inoffensive letter "I". Then Bob DiBiasio came down to greet me. Bob DiBiasio was very cordial and generous with his time. He told me that he had asked others and no one knew of such a plaque. "But let's look around" he said. Soon we had walked through the Executive Offices, down to the main entrance, and then parallel to Eagle Street out past left field, all the way to Heritage Park located behind center field. Dedicated in 2007, Heritage Park is on two levels. The upper level, shown to the left, has 14 pillars in a circle like a small Stonehenge. The floor is made of thousands of brick pavers bought by fans, with the proceeds to Indians charities. The list was selected by Indians fans with the help of a panel of baseball writers and historians and is online. I examined every plaque on every pillar and all the walls. Then I walked the lower level carefully. Dennis Lehman and Bob DiBiasio were right. Nowhere does this place mention that it was once the home of Cleveland's first synagogue building. 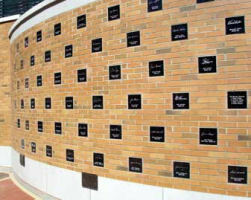 In honoring the memories of these players the Cleveland Indians have created a special space, one that invites reflection and connection. But I had arrived with a mind set on uncovering a different past. As I stood there I was moved by remembering that here, more than 160 years ago, had been the bimah (the elevated platform) and the Ark of Anshe Chesed Congregation. In the Ark (typically a wooden cabinet) was their Torah scroll - the Five Books of Moses written in Hebrew on parchment - that member Simson Hoffman (Hopferman) had brought with him in 1839 from Bavaria. In this place the men of Anshe Chesed prayed using books printed in German and Hebrew, heard a sermon in German, and could look up to the mezzanine where their wives and daughters sat. How grateful they must have felt to be in a country that respected their rights and had even given them land for their synagogue. (Learn more about "the great gift") And thankful too that their small community of peddlers, merchants and tradesmen had been able to build this house of worship only seven years after their arrival. Then Bob and I walked to a gate. I thanked him, we shook hands, and I stepped out on to Eagle Street, sorry that we had not found the plaque. 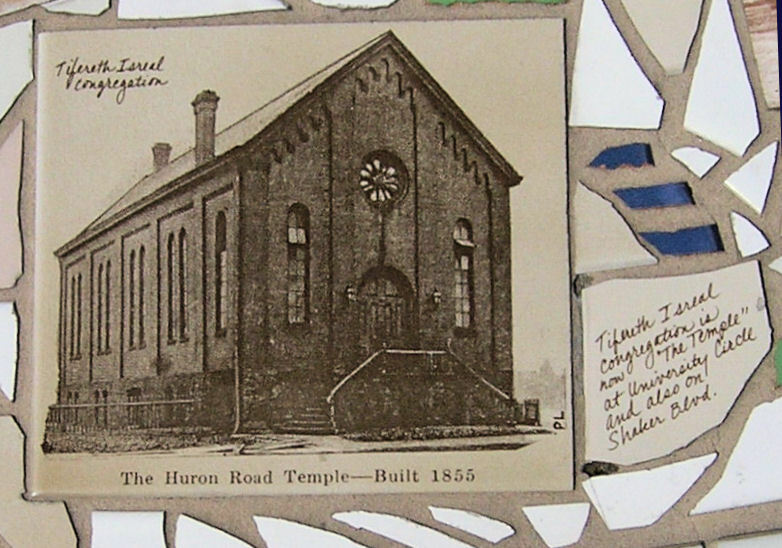 As explained on our Eagle Street Synagogue page, my estimate of where the old synagogue had stood was wrong. It was perhaps 100 feet south of Heritage Park. Though Heritage Park is the best spot for contemplation, it is doubtful if one could stand at the true location - in center field. Visit this Cleveland Indians page and a page on the website of Cleveland Seniors. Brick pavers can still be purchased. As I drove away I found myself in Gateway Plaza, between Progressive Field and the "Q" (Quicken Loans Arena). Then I remembered Dennis Lehman's comment that there may be something on what he had called "the benches." I had passed by this planter many times, but always when rushing to a ball game or walking back to the Rapid in a crowd at night. It was time for a good look so I parked my car at the curb, took out my camera, and started toward the planter. 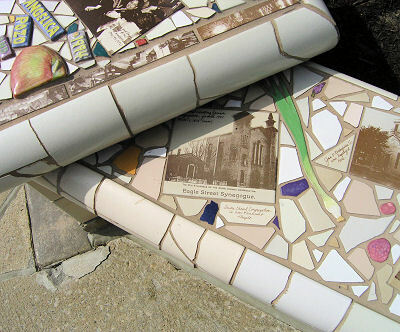 and along the bench-like top are dozens of tiles with old photographs. and associate with Progressive Field! 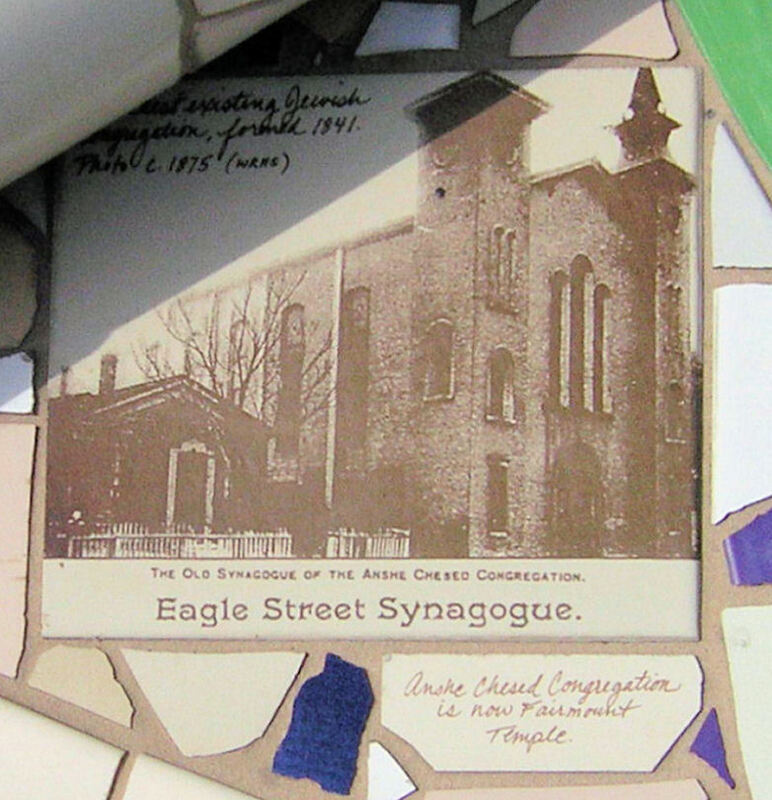 Here' s a larger, better view of the tile commemorating the Eagle Street Synagogue. Nearby on the same bench the Huron Road Temple is also remembered. (now East Sixth), just two streets north of the market. 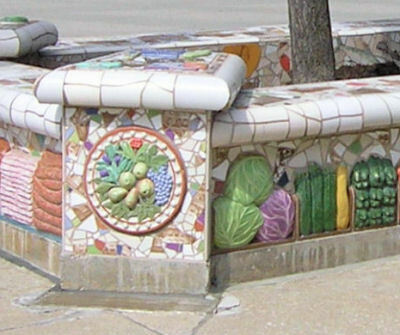 Located on East Sixth Street at Gateway Plaza, just outside "The Q", the 25-foot by 7-foot planter bench was completed in 1994. It is the collaborative work of two Cleveland artists: ceramic artist Angelica Pozo and art photographer Penny Rakoff. Absolute Flooring & Tile Inc. produced the piece on location with the artists' assistance. From this Plain Dealer page. The bench is one of several pieces of outdoor public art at the Gateway complex paid for through donations and private funding and coordinated by the nonprofit group Cleveland Public Art. For more on the Central Market, click here.